Snowbasin Resort is a ski resort in the western United States, located in Weber County, Utah, 33 miles (53 km) northeast of Salt Lake City, on the back side of the Wasatch Range. Opened 80 years ago in 1939, as part of an effort by the city of Ogden to restore the Wheeler Creek watershed, it is one of the oldest continually operating ski resorts in the United States. One of the owners in the early days was Aaron Ross. Over the next fifty years Snowbasin grew, and after a large investment in lifts and snowmaking by owner Earl Holding, Snowbasin hosted the 2002 Winter Olympic alpine skiing races for downhill, combined, and super-G. The movie Frozen was filmed there in 2009. 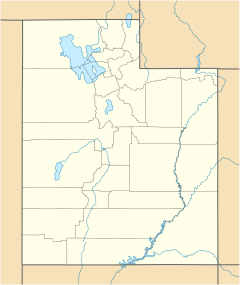 Snowbasin is located on Mount Ogden at the west end of State Route 226, which is connected to I-84 and SR-39 via SR-167 (New Trappers Loop Road). Snowbasin is one of the oldest continuously operating ski areas in the United States. Following the end of World War I and the Great Depression numerous small ski resorts were developed in Utah's snow-packed mountains, and Weber County wanted one of their own. They decided to redevelop the area in and around Wheeler Basin, a deteriorated watershed area that had been overgrazed and subjected to aggressive timber-harvesting. Lands were restored and turned over to the U.S. Forest Service, and by 1938 the Forest Service and Alf Engen had committed to turning the area into a recreational site. In 1939 the first ski tow was built and in service at the new Snow Basin ski park. In 1940, the Civilian Conservation Corps (CCC) crew built the first access road to the new resort, allowing easy access for the general public. Since that time, Snowbasin has continually grown to its present size. Pete Seibert, founder of Vail, led a partnership which bought "Snow Basin" in 1978, but ran into financial difficulty in 1984. The area was sold that October to Earl Holding, owner of Sun Valley in Idaho. Because it was to serve as an Olympic venue site, the U.S. Congress passed the Snowbasin Land Exchange Act in 1996 as part of the Omnibus Lands Bill. The act transferred 1,377 acres (557 ha) of National Forest System lands near the resort to the private ownership of Snowbasin, and identified a set of projects that were necessary for the resort to host the Olympic events. During the 2002 games Snowbasin hosted the downhill, combined (downhill and slalom), and super-G events. The spectator viewing areas consisted of a stadium at the foot of the run, with two sections of snow terraces for standing along both sides of the run. The spectator capacity was 22,500 per event; 99.1 percent of tickets were sold, and 124,373 spectators were able to view events at the Snowbasin Olympic venue. During the 2002 Winter Paralympics, Snowbasin hosted the Alpine Skiing events, including downhill, super-G, slalom, and giant slalom. Terrain park ratings: The Crazy Kat (easier), Coyote (Intermediate), and Apex (Advanced) parks. Grizzly Center Retail and Rentals: 8:00 a.m. to 5:00 p.m.
^ a b c Snowbasin Resort Company (2010). "Our History". Snowbasin Resort website. Retrieved 30 November 2010. ^ a b State of Utah. "History of Snowbasin". Utah History to Go. Retrieved 30 November 2010. ^ "Vail founder buys resort". Spokane Daily Chronicle. Associated Press. October 21, 1978. p. 13. ^ Knudson, Max B. (March 20, 1981). "Snow Basin hopes Trapper's Loop will let cat out of bag". Deseret News. p. D11. ^ "Sun Valley Co. buys Snow Basin resort". Deseret News. October 11, 1984. p. 2B. ^ Grass, Dan (January 24, 1985). "Snowbasin is finally headed in right direction". Deseret News. p. D3. ^ Grass, Dan (September 11, 1986). "Snowbasin". Deseret News. p. D3. ^ Salt Lake Organizing Committee (2001). Official Spectator Guide. p. 64. ^ Salt Lake Organizing Committee (2002). Official Report of the XIX Olympic Winter Games (PDF). p. 75. ISBN 0-9717961-0-6. Retrieved 30 November 2010. ^ Salt Lake Organizing Committee (2001). Official Spectator Guide. p. 186. ^ a b c d e Ski Utah (2010). "Snowbasin, A Sun Valley Resort". Ski Utah website. Retrieved 17 December 2010. ^ a b Snowbasin Resort Company (2010). "Press Kit: Facts". Snowbasin Resort website. Retrieved 17 December 2010. Wikimedia Commons has media related to Snowbasin. This page was last edited on 31 January 2019, at 10:57 (UTC).